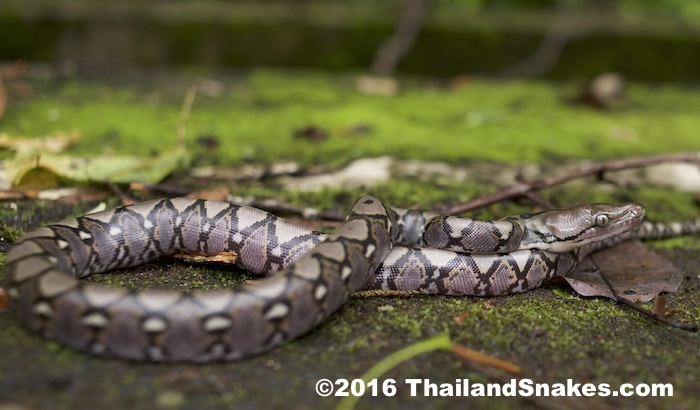 Reticulated Pythons – biggest Thailand snake. Constrictors, no venom. Length: Reticulated pythons can approach 10 meters in length, though there is no hard proof that a member of the species ever reached that fantastic length. Still, stories persist. Pythons of 5-6 meters long are not very common, but they exist. Six meters was the biggest python I’ve ever seen. Typically they are in the 3-5 meter range. Once they reach 4 meters or so they start to eat farm animals and they are quickly found out. 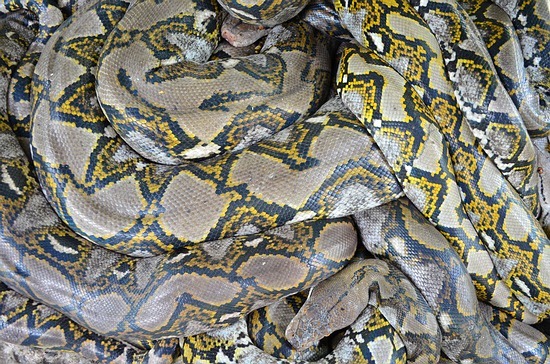 Pythons of this size are either killed, or dragged to the local snake show where they die in unclean cages or of stress. This just hatched Reticulated Python was only 60 cm long at birth, and can grow to more than 8 meters long. Appearance: Intricate design of yellow and black lines over tan background. 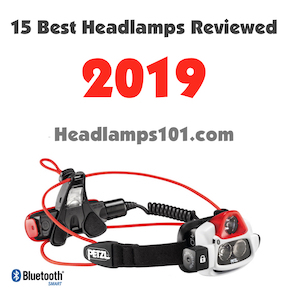 Head is strongly separated from neck. Can get around 1 foot in thickness. 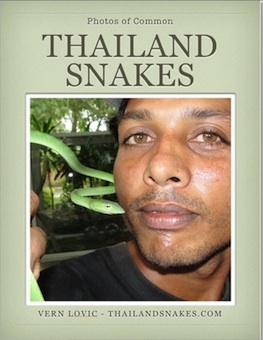 Range: All over Thailand and some other Southeast Asia countries – Burma, Malaysia in many types of habitat. Habitat: I have found them high up in trees in the mangrove above the saltwater and in the ocean near a mangrove forest. I have also found them in quite dry areas nowhere near saltwater and in residential areas as well as in floating huts on a river in the northeast. Found often during rain, it is thought they eat frogs along streams when they cannot find a large meal. These pythons are rather common, and much more so than the other pythons. Adult Reticulated Python – will it grow to 30 feet long? Active Time: Primarily active nocturnally, but can be found during daylight if disturbed, or sleeping at ground level. Food: Prefer animals related to their size. Chickens of all sizes seem to be preferred, though pigs, dogs, cats, goats, frogs and other animals are taken with regularity. 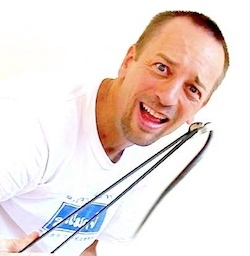 Defensive Behavior: Curl into an S for a long strike. Strike is not that fast when they are big, but they have great reach! Watch out for very high strike on the upper body. The reticulated python is quite able to defend itself and it will not hesitate to strike anything that is aggravating it. Strikes can be 2 meters in distance and they can strike quite high – head high even. They have rows of teeth – 78 by one count, and they are very strong and curved. If you are bitten by a large python you can easily be killed as they wrap their very strong body around you and suffocate you or raise your blood pressure to such a degree that your heart can no longer beat. Your best chance is if you have a friend with you. That said, these snakes very rarely prey on man. Venom Toxicity: Not known for dangerous venom, though all snakes are said to have venom (proteins) in their saliva. 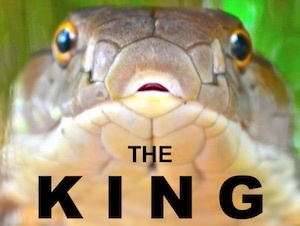 This snake kills by squeezing prey until the blood pressure is so high the heart cannot beat. Death is not due to suffocation as previously thought. Offspring: About 50-70 cm long in large eggs. Only Blood Python eggs are known to be larger (of snakes). Hatch in June-July. Notes: I have found a number of these pythons over the years. Many times they are swimming in water, or in trees above water – both fresh and saltwater. They have a habit of cruising up streams – where they eat large frogs and other prey. 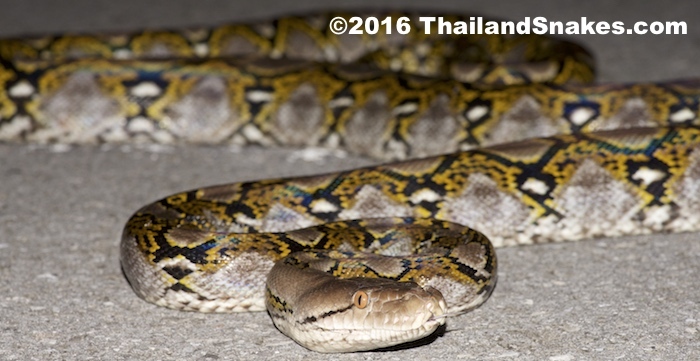 The largest I have ever seen in the wild was a 5-6 meter python in Krabi which was in a freshwater stream about midnight. A magnificent sight! If you knew it was a python – why’d you kill it? They aren’t completely harmless. There have been two cases just this year that people (adults) have been eaten by large pythons. Those were killed to recover the bodies. One sailed over my foot in Bangkok the other night. I just stayed away but couldn’t help filming it. It was busy eating a rat so I thought it would be ok to get closer and film it. I wish I could post the video. Next Next post: How to Remove Snake During Bite?